Grab your coupons and score FREE Mentos Gum at Dollar General this week. 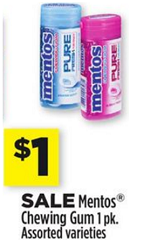 It's at Dollar General that you will find Mentos Gum on SALE for $1. You can use the $1 off coupon found in the August 4th Smart Source coupon insert to score for FREE.